The $15 minimum wage has been a very interesting point. One that is not very well thought out, yet still is touted and entire groups advocating for minimum wage laws to be implemented. When you have people who make less than $15 an hour on their job, you can only imagine the levels of cruelty that exist due to their job's lack of income, which happens to be less than what is allowable for a liveable life on your own. 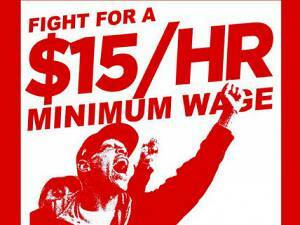 Economically a $15 an hour job is a shot into the foot of the American economy. Because while at the end of the day, the $15/hr job would create a huge economic shortage of jobs. How is that possible? Most people are already aware of the practical aspect of bosses that wouldn't be interested in paying someone $15 an hour versus just purchasing a machine that has lower costs of maintenance than a $15 an hour job. Yet at the same time, I like to look at it at an economic perspective as it then becomes much clearer. I will play around with this economic graph so you can see how this works from an economic perspective. 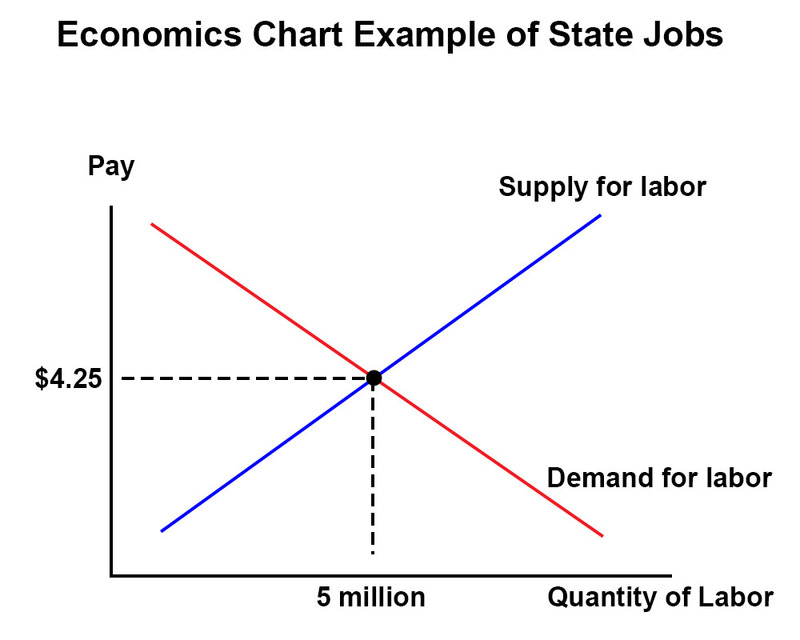 Red represents the demand for jobs while blue is the supply line. 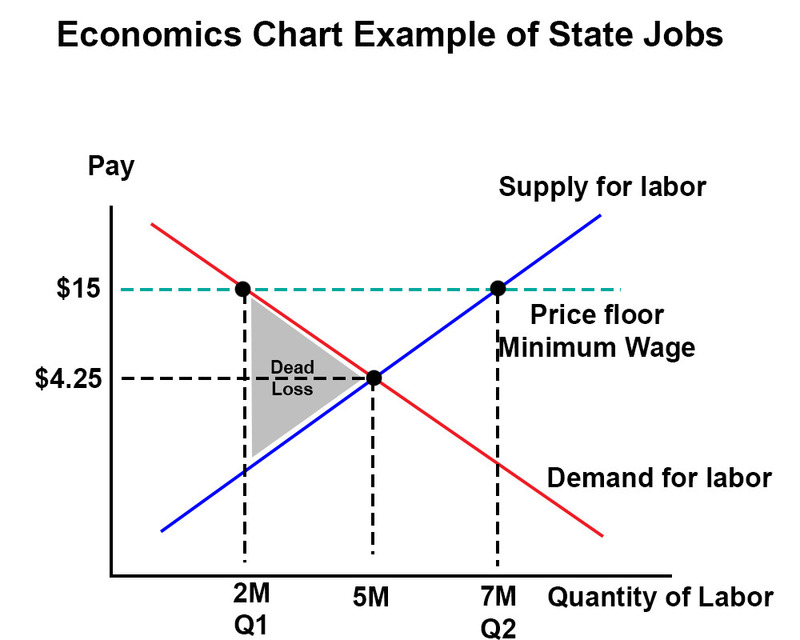 As the quantity of labor increases, the less payment exists. 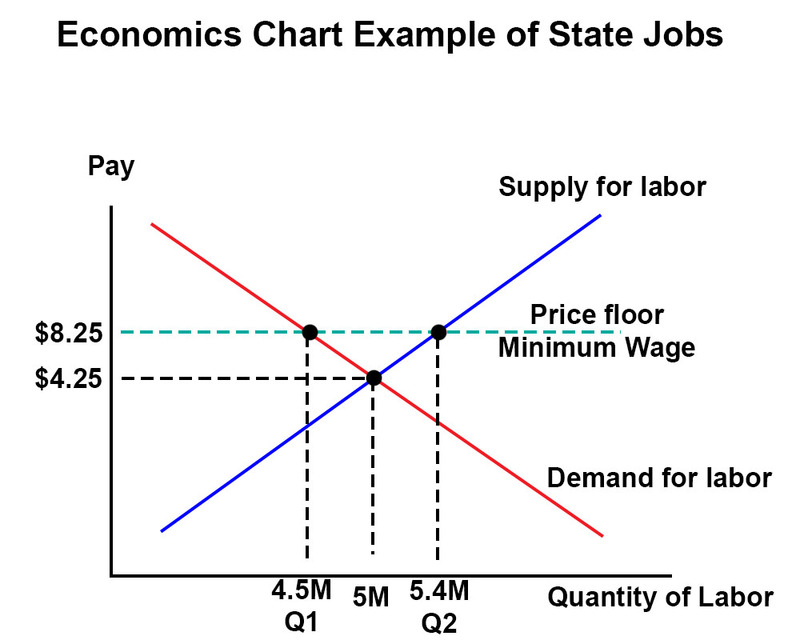 The number $4.25 represents a more realistic price of equilibrium versus the current $8+ hour jobs. If someone wants to get angry about that, please take a look at the number of illegal immigrants that are currently working less than minimum wage to satisfy the demand of the market. Though we're just using these numbers as an example as if there was a completely unregulated market. Let's also consider the quantity of labor being 5 million people willing to work $4.25/hr for a job. Now the question becomes: What is happening here? Well, Q1 represents the amount of jobs now available. Q2 represents the amount of people willing to work. If there are 5.4 million people willing to work, but now 4.5 million jobs available, that results in a shortage of jobs. Actually, to put it simply. Economic DEAD LOSS between the 4.5 million Q1 and the 5 million jobs available at $4.25. It is because of this that you have an influx of illegal labor. There exists a demand for labor that is not met with the minimum wage laws. So economic laws would fight against the government to meet the demand for labor that exists. People willing to pay under the table to avoid taxes and other individual price floors when people in general are willing to work for less to meet their needs. Now let's represent the new law of $15 an hour. The representation is still the same. Except now it's a lot more dramatic. People are willing to work at $15 an hour for sure. A lot of people. The supply is way up from the original 5 million now to 7 million people willing to work. However, the jobs market isn't looking so good. Because while there are 5 million jobs available, only 2 million jobs are willing to pay the minimum of $15 an hour, resulting in a huge dead loss of potential jobs. What does this mean? Well, if your job pays over $15 an hour, you are safe. But if your job pays less than that, those businesses either better do some major innovations or go out of business, resulting in shortage of jobs. This does not raise quality of life, so much as it destroys the two bottom rungs of the ladder making it harder for youth and disenfranchised to climb up it.